Having survived a French attack whilst still in European waters, Temeraire is left badly wounded and the crew badly shaken. But Prince Yongxing takes this as another chance to try and exert his authority. He really hasn’t got the idea yet that ordering Will to stay away from Temeraire simply Will. Not. Work. There’s a slightly sense of foreboding for me here: our boys are en route to an Imperial culture where absolute obedience in all things is not only expected, but disobedience is unthinkable. Neither Temeraire nor Will are going to fit in, and the Chinese seem less likely to suffer Will’s insubordination to keep Temeraire happy (they wouldn’t send a Celestial to war even if they were at war). But for now, they are at sea and Yongxing has limited options. So an angry Will forbids him the dragon deck. Or at least, he thinks he does. Enter young Hammond, who immediately goes behind Will’s back to negotiate access with Captain Riley before Will can brief Riley otherwise. After all, the news that the Chinese commandeered British ships to sail to London means the Chinese simply aren’t safe on deck with the sailors – the dragondeck is the only place they can take the air, and it would be inhumane to lock them belowdecks for months (not to mention detrimental to relations). On the one hand, I have to admire Hammond’s quick thinking. On the other, it’s probably just as well that Temeraire never realises how much Hammond undermines Will, or it’s entirely possible the young man would have an unfortunate accident involving a tail flick, the rail, and a quick dip in the high seas. Although Will is left grinding his teeth, Yongxing initially keeps his distance. It’s Sun Kai who ends up on deck all the time – and particularly interested in the guns, which I’m filing away for future reference (not least because the 3rd book is Black Powder War) – and amiable Liu Bao who unintentionally thaws out Anglo-Chinese relations. When a bad storm gives him a terrible case of sea sickness, Will takes pity and sends him some ship’s biscuit to calm his stomach. The cure is a success (leading to a neat reciprocation later on, when the Chinese cooks help Temeraire get through a case of manflu dragonflu by feeding him spicy food he can actually taste) and Will invites the Chinese to a rather more successful dinner, where we discover dragons write poetry. This opens the door for Yongxing to embark on a charm campaign, sitting on deck with Temeraire and reading poetry to him. Language learning in the shell requires exposure and Temeraire left China as a very young egg, so we also get the twin amusements of watching Yongxing correct the dragon’s pronunciation and watching steam come out of Will’s ears as he tries to keep a grip on his jealousy. In fact, tempers are fraying across the ship: the naval crew remain shy of Temeraire after his sinking of the French ship with all hands; and the airmen feel they lack gratitude. When deniable squabbles erupt into a fist fight, Will has no compunction about wading in to stop and punish it (remember, an airman cannot be permitted to brawl or duel by order of the Service). Unfortunately, this means the naval crew feel like they’ve won as Will follows through with naval discipline and has his man flogged for striking an officer. And, unexpectedly, I approve. I will admit to admiring Will’s leadership even though my sympathies lay with the airmen. The rules are clear. It’s harsh – but military discipline is harsh for a reason – and it serves its purpose. I have even more respect for the air crew, who take it on the chin. They may still dislike the sailors, but they don’t resent Will. Temeraire, however, is sorely chastened. Will reprimanded him sharply during the confrontation – a first in their relationship – and he is far from reconciled to the punishment of his crew. He and Will have had their first tiff, but it’s soon apparent the bromance is strong: when Yongxing tries to capitalise on Temeraire’s discontent and suggests a more worthy companion will be found in China, Temeraire does his very best offended cat impression, hissing, putting back his ruff and coiling possessively about Will (why yes, it IS adorable). Then the ship puts in at a slaver port to resupply, and Will is obliged to explain the concept to Temeraire. Needless to say, slavery does not sit well with the young dragon; nor does it with Will, whose father is part of the emancipation lobby, and feels obliged to reassure Temeraire that it will soon be stopped. His comments causes trouble with Riley – whose family have made a fortune from slavery and whose father has been embarrassed by Will’s in Parliament. Will’s outspokenness has two immediate effects: frosty relations with Riley, and a sudden interest in his family from the Chinese. The discovery that Will’s father is some sort of official (as they understand it) is clearly intriguing, although not sufficiently so to prevent Yongxing from attempting a new angle of attack: he tries to bribe Will to desert Temeraire. When an outraged Will refuses a small fortune, the Prince offers political concessions instead… and Will – hating himself for doing so, afraid he is handing the war to Napoleon – rejects them. Entirely unexpectly, Hammond approves. While it’s really hard to like Hammond – he’s either deliberately obtuse or honestly unaware of other people’s feelings – I have to admire his political acumen. He’s terrified that Will might have accepted the Prince’s offer, because he’s certain that the simple fact Yongxing made it is an indication that a better deal can be brokered once in China. An ambassador and a vow to stay out of the war isn’t good enough for him – he wants trade concessions too. This in spite of the fact the ship has received news that Napoleon has inflicted a crushing defeat on Austria at Austerlitz. Britain is running out of allies. Hammond: there’s more to him than meets the eye. After all the tension, we segue into a series of lighter moments. If there’s one thing I like (and perhaps I like it because I’m reading this as a weekly serial; I might like it less if I were more focused), it’s that Naomi Novik doesn’t shy away from the reality that it will take months to get to China. 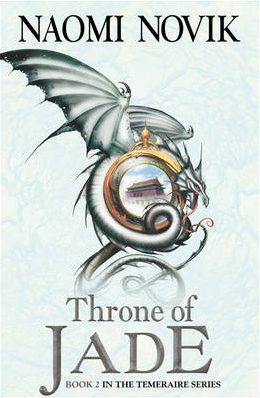 Throne of Jade is predominantly a journey book, and a slow one at that – episodes breaking up quiet sailing and intermittent weather. So we have Temeraire swimming (and playing with a rowing boat! ); we cross the Equator with much pageantry; and we have a visit from James and Volly with the last post, which outs Temeraire as an accomplished thief – since their departure, the other Muskedragons have been discovered sneaking sheep from the feeding pens in between meals thanks to his lessons. Will might have maintained his moral high ground if he hadn’t been laughing so hard he couldn’t breathe. Cross-cultural exchange over dinner also continues, with much entertainment regarding the officers inability to get on with chopsticks. As the British struggle, a stray remark results in the Chinese realising that Will’s father is not an official but a Lord and they become very interested in his genealogy and precise relationship to the King (well HALLO perhaps Captain Laurence is a worthy companion after all, eh? EH?). Whether Will is happier to escape their cross-examination or the endless courses of food is open to debate. While Will chides his friend for exaggeration, his reassurances frankly leave room for improvement. Apparently it still wouldn’t do as a general rule, and it’s different for girls like Roland, because “They are raised to the life, you know, and under such circumstances habit may trump even birth”. Thankfully, Temeraire agrees. He points out that Lily is a perfectly capable dragon (although his pride struggles with an initial admission that she’s as good a fighter as he is) and calls out Will for saying women are smaller and weaker: Temeraire is smaller than Maximus, and Harcourt (from Temeraire’s perspective at least) is not so different to Will (I suspect this is entirely untrue, but I’m going to sit atop his head and nod vigorously). YAY EQUALITY LIZARDS. Live reactions as we read are captured on Storify (week 2 sadly without me as I was abroad) thanks as ever to @effingrainbow. My delayed week 3 will be up soon. Our final #ThroneofJade live tweet-along will be next Sunday at 9pm BST. Posted in Read-Alongs, Temeraire and tagged alt history, books, dragons, fantasy, naomi novik, read-along, Temeraire. Bookmark the permalink.